Like an angry dog, a volcano growls before it bites, shaking the ground and getting "noisy" before erupting. This activity gives scientists an opportunity to study the tumult beneath a volcano and may help them improve the accuracy of eruption forecasts, according to Emily Brodsky, an associate professor of Earth and planetary sciences at the University of California, Santa Cruz. Brodsky will present recent findings on pre-eruption earthquakes on Wednesday, December 16, at the fall meeting of the American Geophysical Union in San Francisco. Each volcano has its own personality. Some rumble consistently, while others stop and start. Some rumble and erupt the same day, while others take months, and some never do erupt. Brodsky is trying to find the rules behind these personalities. "Volcanoes almost always make some noise before they erupt, but they don't erupt every time they make noise," she said. "One of the big challenges of a volcano observatory is how to handle all the false alarms." Brodsky and Luigi Passarelli, a visiting graduate student from the University of Bologna, compiled data on the length of pre-eruption earthquakes, time between eruptions, and the silica content of lava from 54 volcanic eruptions over a 60-year span. They found that the length of a volcano's "run-up"--the time between the onset of earthquakes and an eruption--increases the longer a volcano has been dormant or "in repose." Furthermore, the underlying magma is more viscous or gummy in volcanoes with long run-up and repose times. Scientists can use these relationships to estimate how soon a rumbling volcano might erupt. A volcano with frequent eruptions over time, for instance, provides little warning before it blows. The findings can also help scientists decide how long they should stay on alert after a volcano starts rumbling. "You can say, 'My volcano is acting up today, so I'd better issue an alert and keep that alert open for 100 days or 10 days, based on what I think the chemistry of the system is,' " Brodsky said. Volcano observers are well-versed in the peculiarities of their systems and often issue alerts to match, according to Brodsky. But this study is the first to take those observations and stretch them across all volcanoes, she said. "The innovation of this study is trying to stitch together those empirical rules with the underlying physics and find some sort of generality," Brodsky said. The underlying physics all lead back to magma, she said. When the pressure in a chamber builds high enough, the magma pushes its way to the volcano's mouth and erupts. The speed of this ascent depends on how viscous the magma is, which depends in turn on the amount of silica in the magma. The less silica, the runnier the magma. The runnier the magma, the quicker the volcanic chamber fills and the quicker it will spew, according to Brodsky. The path from chamber to surface isn't easy for magma as it forces its way up through the crust. The jostling of subsurface rock causes pre-eruption tremors, which oscillate in length and severity based on how freely the magma can move. "If the magma's very sticky, then it takes a long time both to recharge the chamber and to push its way to the surface," Brodsky said. "It extends the length of precursory activity." Thick magma is the culprit behind the world's most explosive eruptions, because it traps gas and builds pressure like a keg, she said. 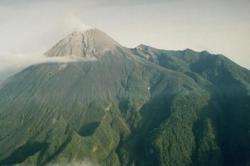 Mount St. Helens is an example of a volcano fed by viscous magma. Brodsky and Passarelli diagrammed the dynamics of magma flow using a simple analytical model of fluids moving through channels. The next step, Brodsky said, is to test the accuracy of their predictions on future eruptions. Volcanoes are messy systems, however, with wildly varying structures and mineral ingredients. Observatories will likely have to tweak their predictions based on the unique characteristics of each system, she said. The problem with volcano eruption alerts is not only the geology, but psychology. If you issue eruption warnings and nothing happens, many will ignore the warnings on the occasion evacuation is justified. It is the same thing with tsunami alerts.